Many Mac users who rely on Mail app for accessing their emails in Mac OS are in the habit of navigating emails with their mouse, double-clicking an email, closing it, then repeating to go to the next message. A lesser known option is to use the keyboard to navigate within Mail messages of Mac OS X, which can be considerably faster for many users once they learn the tricks of how to use it. Not only can you navigate between emails this way, but you can also reply, send, forward, mark as unread, and perform many other Mail functions directly with a keystroke. 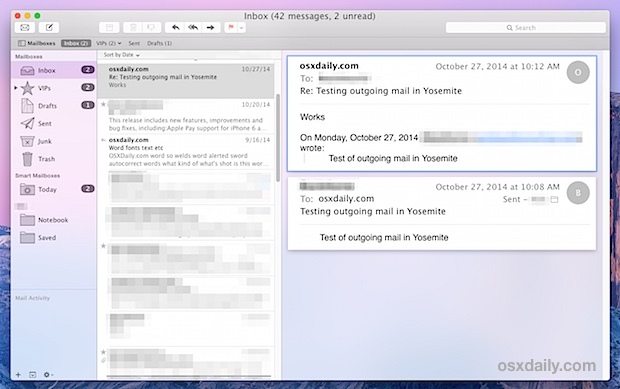 To use keyboard email navigation in the Mac Mail app, you’ll want to start at the primary double or triple pane primary Inbox screen as if you just opened Mail. The rest is just a matter of using the keyboard rather than the mouse, and making a new habit of that. That will allow you to move between the next and previous mail message using just the keyboard, but if you want to start replying to, forwarding, marking as unread, and other common mail activities, you’ll want to use some other keyboard shortcuts. To really get the most use out of this, you’ll want to be using Mail app expanded to take up a sizable portion of the screen, if not using fullscreen mode. You’ll also want to break the old habit of double-clicking an email message to open that message into it’s own window, and instead use the arrow keys to select the message to view, and the spacebar to scroll down in the active message, which is why it’s important to have a large enough Mail window so that you can read the message content of the emails you are selecting. By the way, if you find the email content text to be either too small or too big, you can change the font size in Mail rather easily. Of course, navigating between the next and previous message in your inbox is one thing, you’ll likely want to interact with those messages to, which is where the next set of keyboard shortcuts comes in for a variety of tasks in Mail app for Mac OS X. There are many other keyboard shortcuts for Mail in MacOS X, but these are some of the essentials that are worth remembering without being overloaded with some of the more obscure options. Exploring the Mail menu items will reveal many more, and you can always create a custom keystroke for something if you discover a menu item function that doesn’t yet have an attached keyboard shortcut. At the moment, the Mail app in Mac OS X does not include a “Next Message” or “Previous Message” keyboard shortcut that is independent of the arrow keys for selecting messages, which can lead to some confusion for users who have turned to the Mail app in Mac OS X as their default email client, particularly if they came to Mail from another email client like MS Outlook or Thunderbird. Note that none of these keyboard shortcuts for moving around Mail are specific to any version of Mac OS X, they’ve been on the Mac for quite some time and therefore will work regardless of the computer running MacOS Mojave, High Sierra, Sierra, El Capitan, Mac OS X Yosemite, Mavericks, Mountain Lion, Snow Leopard, and likely just about any other version too. Considering that iOS does include a “Next” and “Previous” message button in the Mail app on iPhone and iPad, it wouldn’t be too surprising if such a feature was added to the Mac sometime in the future. In the meantime, use the arrow keys and spacebar trick, it’s effective and makes browsing through a ton of emails quite fast. Clicking on “received” all messages will be sorted, but how do I jump directly to all senders starting with “G” for example… in Outlook I just press the desired letter “G” for example, and in the MAIL…. How do I do… ? Personally, I use Cmd-Shift-N a lot, to ‘Get New Mail’, and also Cmd-Alt-0 (zero) to show/hide the Activity window, especially when I’m expecting an important email. Prior to Yosemite, Option-clicking the trashcan icon would delete the selected message without then auto-selecting another message in the list. Now with this same sequence on Yosemite another message always becomes selected (and depending on settings it will be marked as Read). I would love to have the prior behavior back. Sometimes I’m just not ready to handle another message but I’m ready to delete the current one. Ok, you’ll have explain what you mean, I’ve never heard of that shortcut before. The way you describe it is that you (a) select a message, then (b) Option-click Mail’s Trash icon and that selected message is deleted? I’ve never seen this work in either Yosemite or earlier versions. In fact, it would not make sense to have such a shortcut, as you can very easily select one or more messages, then press Delete. You probably mean something else. You’ve got the idea of how it used to work. The advantage was that no matter how many messages were selected and then Option-click on the trashcan icon, no other message became “selected”—thus no other message becomes Read just from deleting something as happens now. I understand what you mean now. However, if that shortcut did ever exist, they rightly decided it’s completely useless and removed it; I don’t see the point of having it. “if the shortcut did ever exist”?? why else would he spend all this time describing it to you? because “YOU don’t see the point”?? There are certainly MANY things in this world that you don’t understand, and therefore don’t see the point. But why are you wasting our time explaining why the question is “pointless”… just because you don’t understand it? Perhaps this isn’t the best use of your time… i promise you, it’s not the best use of OUR time. With Yosemite mail, I understand how to change the font of a message, but how do I change the font of the actual mailbox names on the left side along with the words sent, draft etc? Can open URLs from within an email in Safari without Copy/Drag to Safari open window. Quick view works. Add to Reading List works. Open with Safari does not work. In Yosemite Mail (Version 8.1 (1993)), tapping the Space bar does not scroll down on the contents of an active/selected message? Is anyone else having this problem? I was having exactly the same problem. The issue in my case, it turns out, was from the Mail Act-on plug-in I have installed. On the “Message Viewing” tab of Mail Act-on’s preferences, make sure “Spacebar advances to the next unread message” is set to OFF. Hope this helps. What happened to Shift Command K for selecting multiple related emails in Mac Mail? After installing Yosemite this no longer works. I would like to be able to ‘quick look’ an email (to see if it is the one I think it is without having to open each one). Almost everything else on a Mac can be ‘quick looked’ using the spacebar but not emails.